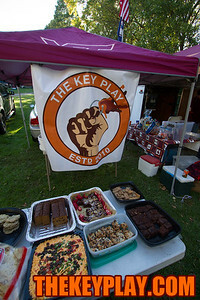 The official The Key Play Tailgate! 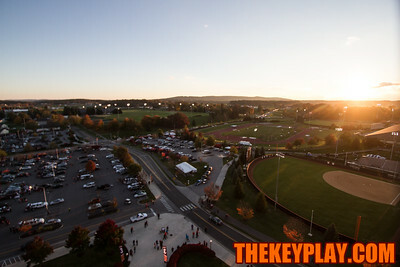 The sun sets overlooking Spring Road and Southgate Drive. 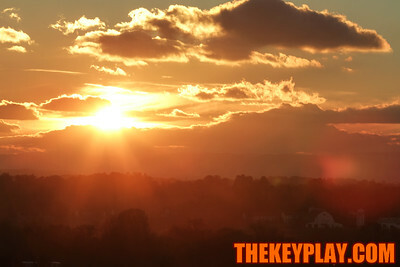 The Blacksburg sunset as seen from the top of Lane Stadium. 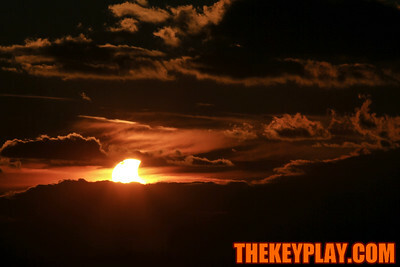 The Sun is partially obscured by a Lunar Eclipse as it sets over Blacksburg a couple hours before the game. 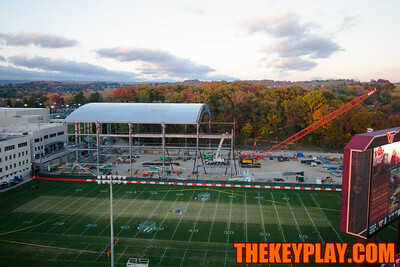 The new indoor practice facility construction site shows half of the stucture already assembled. 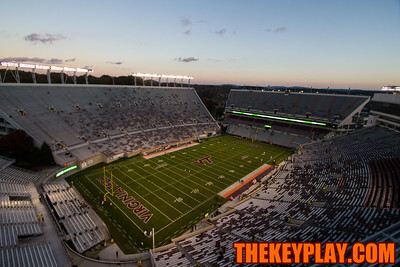 Lane Stadium sits quiet a couple hours before kickoff. 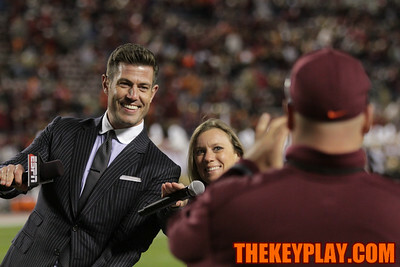 ESPN color commentator Jesse Palmer poses for a picture on the field before kickoff. Kaitlyn Boyer, one of the featured twirlers with the Marching Virginians, performs with a flaming baton before kickoff. 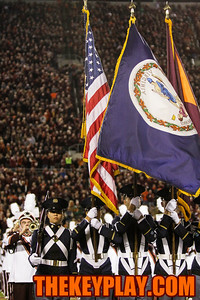 The Corps of Cadets Color Guard stands at attention before the national anthem. 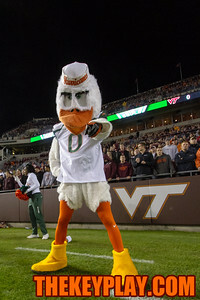 Sebastian the Ibis shows off his stuff on the sidelines of the South endzone. Deon Newsom attempts to tackle Miami's Tracy Howard on a kick return. 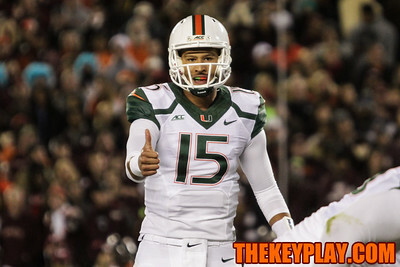 Miami Freshman QB Brad Kaaya signals to his offense before a play in the first quarter. A Virginia Tech cheerleader goes flying in the air during a TV timeout. Miami QB Brad Kaaya releases a pass while getting hit hard by Deon Clarke in the 1st quarter. Miami RB Duke Johnson stands ready before the snap. 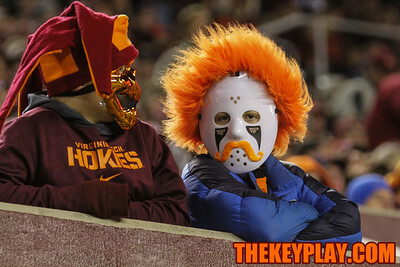 A pair of young Virginia Tech fans show their Halloween spirit in the West Stands. Virginia Tech QB Michael Brewer signals to his offense. Michael Brewer rolls out of the pocket on a pass as Sebastian the Ibis watches from the endzone. Miami's Deon Bush recovers a Marshawn Williams fumble at the goal line in the third quarter. 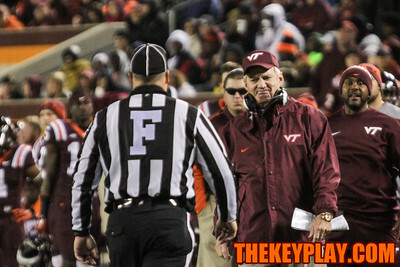 Head coach Frank Beamer gives referee Mark Furtado a look after the Hokies lost the ball on a fumble. 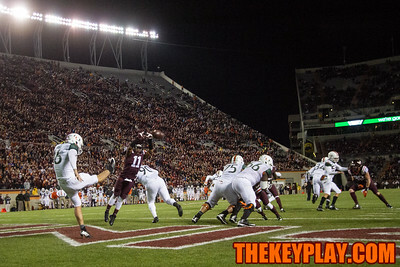 Miami's Justin Vogel punts the ball out of his own endzone as Kendall Fuller (11) attempts to block it. Joel Caleb (15) fumbles the football after catching a pass from Michael Brewer in the third quarter. Miami recovered the loose ball. 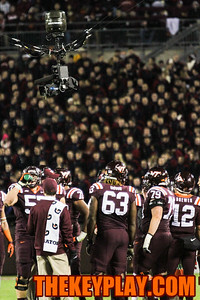 The Hokies huddle during a TV timeout with the watchful eye of the Skycam above them. Marshawn Williams (42) runs the ball at the Miami defense. Miami's Michael Wyche (11) attempts to strip the ball from Marshawn Williams (42) in the third quarter. Dadi Nicolas (90) tackles Miami's Gus Edwards. Marshawn Williams (42) gets dragged down from behind by a pair of Miami defenders. Miami's Duke Johnson stiff arms Chuck Clark after a big gain in the 4th quarter. 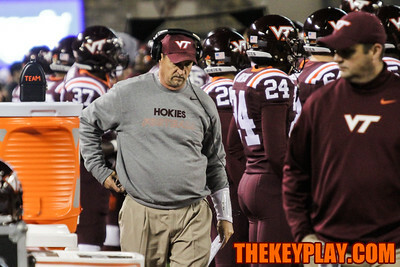 Virginia Tech defensive coordinator Bud Foster walks by the team bench late in the 4th. Detrick Bonner (8) helps up a Miami player after a play. 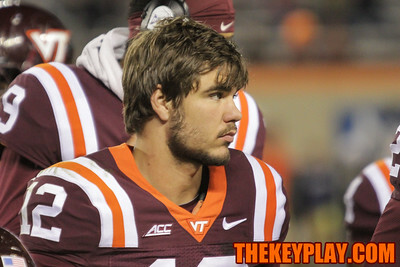 QB Michael Brewer looks on as backup Mark Leal gets some playing time late in the 4th quarter. Sam Rogers (45) runs the ball hard late in the 4th quarter. 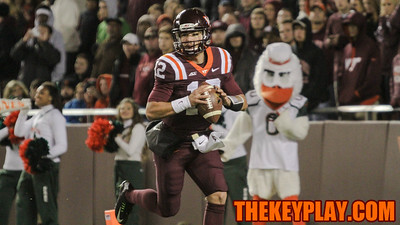 Backup quarterback Mark Leal stands in the pocket before throwing Virginia Tech's only touhdown of the game. 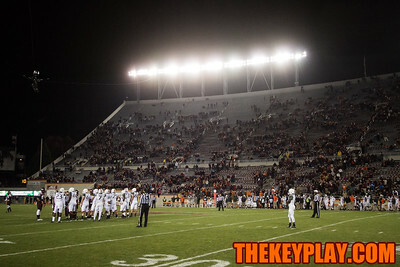 Miami gets ready to kneel the ball before an empty Lane Stadium late in the 4th quarter. 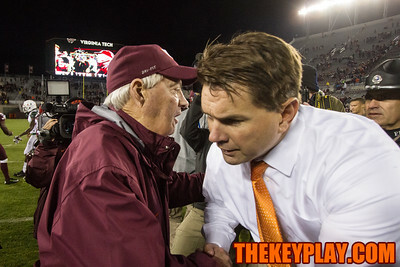 Virginia Tech head coach Frank Beamer shakes hands with Miami head coach Al Golden at the end of the game. 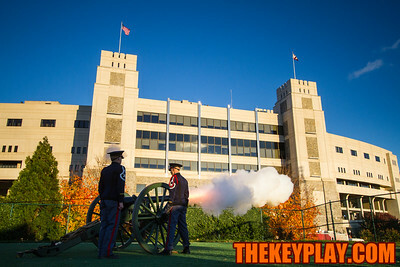 The Hokies lost 30-6.